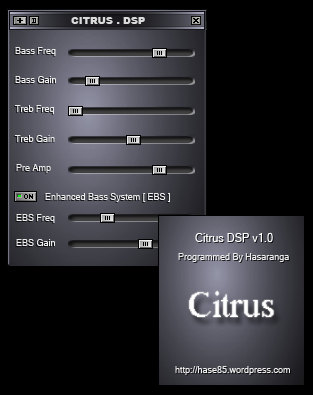 Citrus DSP is a dsp plug-in which can improve sound quality using EBS technology. Citrus artificially generates bass signal and mix it with original signal to improve the sound quality. First you have to select proper bass frequency using “Bass Freq” slider. Then adjust bass gain using “Bass Gain” slider. if you use EBS, it is better to set this value less than half. Always use this slider instead of EBS gain slider. Enable EBS & set EBS frequency slider value less than half. Use the image on this web page as a tuning reference. You are currently browsing the Tools & Technologies From Hasaranga blog archives for April, 2011.